Definitely worth travelling to see - the "other" Hampton Court in Herefordshire! Hampton Court in Herefordshire (not to be muddled with the palace in London) is complicated! It not only shares its name with another great garden in Britain, but also has a confusing history. There've been four major families involved in the estate since the 15th century; the castle has been totally rebuilt once, and restored several times since it first appeared. 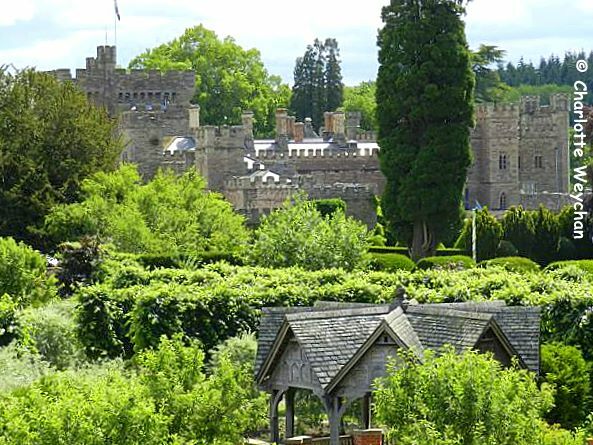 What you see there today is largely thanks to an American – Robert Van Kampen – who arrived in Herefordshire in 1994 and restored the castle to its former glory. 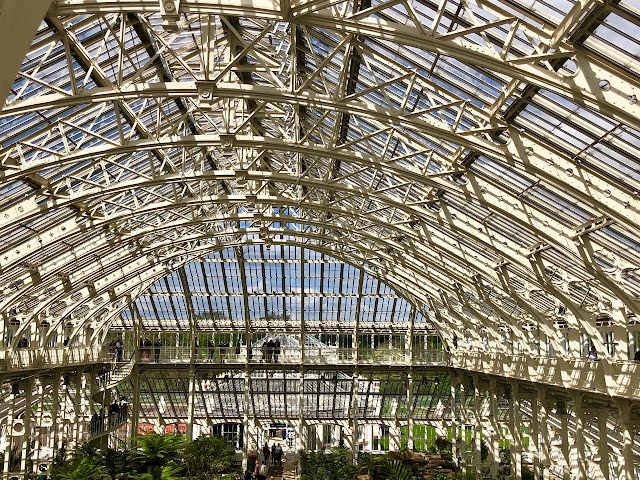 The gardens and all buildings within them, were designed by Simon Dorrell, who was virtually unknown when he undertook this commission for the Van Kampens. 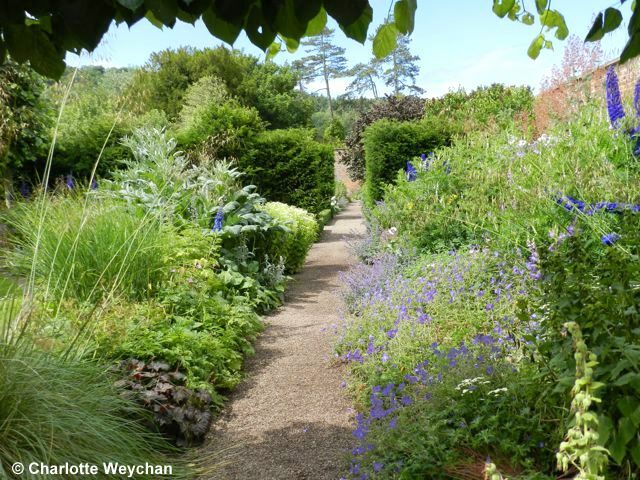 But he is now well-established as one of the two designers associated with Bryan's Ground gardens on the Herefordshire border (I couldn't get there this week, but for an excellent review, click on the link) and for the gardens currently under restoration at Bruton Court near Leominster. Definitely a name to watch out for as he leaves his mark on this part of the world! The main gardens here at Hampton Court are walled, but divided into two parts. 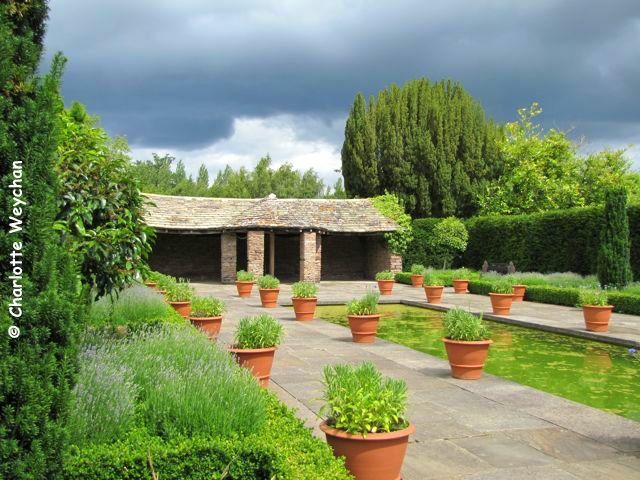 As you enter you find yourself in the Vegetable Garden which is now an ornamental kitchen garden complete with glasshouses, which leads onto the Flower Garden, which will take your breath away. Here there are pleached lime walks, canals and in the middle of each of the two canals, an octagonal pavilion constructed of brick and wood. Bold Arts & Crafts style borders run the full length of the kitchen garden walls and there's also a formal rose garden (above). The Flower Garden's herbaceous borders are in full bloom right now (above), and most visitors seem to spend as much time admiring these as they do the formal design elements of the garden, but make sure you don't miss the additional borders outside the garden walls, or the Dutch Garden, closer to the castle when you're here. The latter was being replanted when I visited this week, but still looked pretty impressive against the backdrop of the thunder clouds (below). There are 20 acres of grounds here at Hampton Court and I suspect that many visitors never get beyond the walled gardens, and judging by the empty maze, even fewer make it to the Sunk Garden! 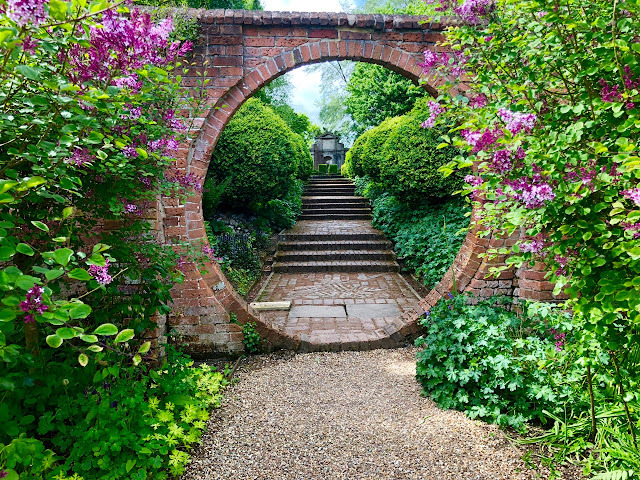 There's a tunnel that connects the two, but if the prospect of a dark passageway is too much for you, you can access the sunk garden by steps. Both are well worth searching out and once you get to the centre of the maze, you can climb the tower for a panoramic view over the gardens. But rest assured, wherever you are at Hampton Court, you’ll hardly see a blade of grass out of place, a hedge needing cutting or any drooping dead heads! 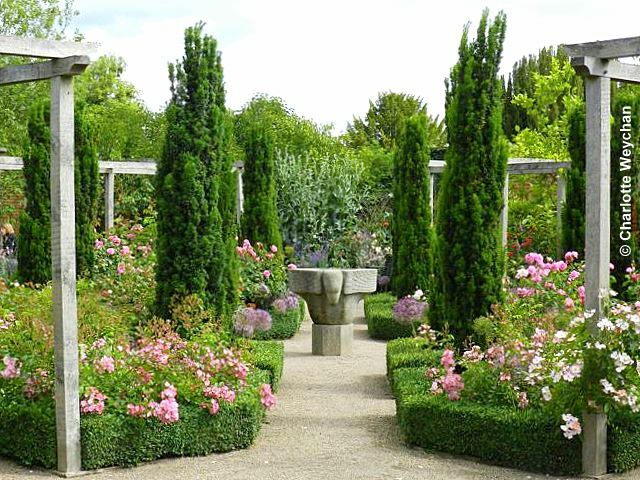 This garden is certainly impressive and goes high on my list of gardens worth making a detour for if you're anywhere within a 20-mile radius!! Open daily until the end of August from 10.30 - 17.00. And it's just one of six splendid gardens I've visited this week in my two-day gallop around this part of the world, so I've got lots of treats in store for readers in the next couple of weeks! How beautiful and inspiring! I will have to visit it sometime. You're making me want to take a garden tour of the country! This garden is amazing! I truly love having the opportunity to see this gorgeous part of the world. Thank you! I agree it is well worth a visit. I lived in the tumbled down farmhouse on the estate a few years ago and got to know the gardens very well. 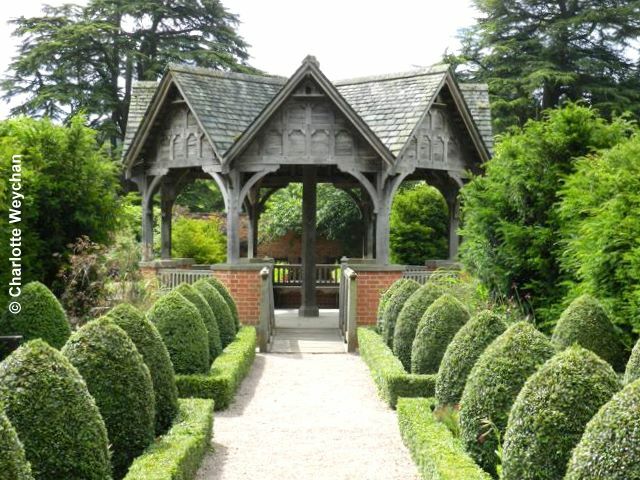 My neighbour (a timber framer) was the one who built the pavilions. A talented man by the name of Adam Heath. I have moved round Herefordshire a lot, including living next door to Simon Dorrel at Bryans Ground. Just realising how lucky I have been!!!! It may be confusing, but who cares, gorgeous! great tour, want to go! need an intern? 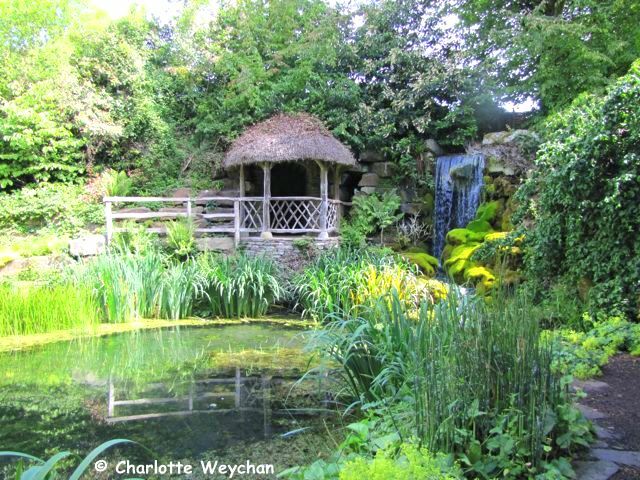 The Herefordshire Hampton Court is one of my 8 "desert island" favourite gardens (and again, one of the few gardens I've blogged about). Wonderful, isn't it? R and I both really fell for the kitchen garden, but the whole place is impressive, as you say. It's a real advert for organic gardening too! have to agree it is a lovely garden, ta for sharing.